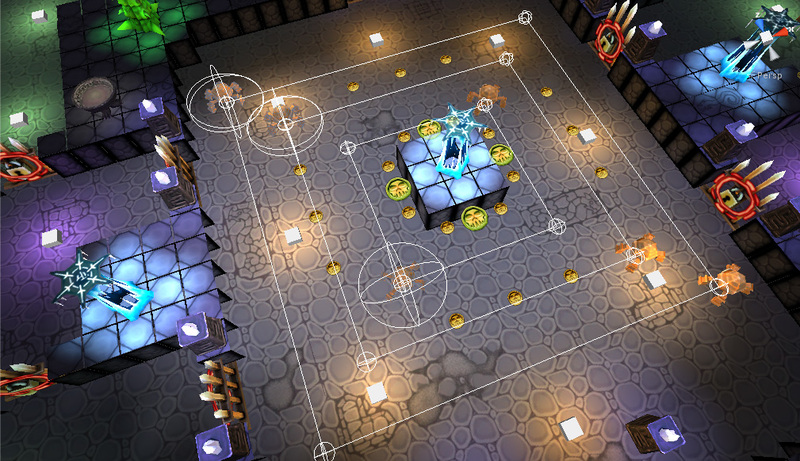 Goblin Quest: Escape is an action packed dungeon runner / reverse tower defense hybrid game! You’ll control Mook the Goblin as he dodges towers, evades enemies and makes his escape. This unique game was previously released on microconsoles and mobile and is now coming to Steam! The focus of the game is exploring the dungeons, surviving only through means of cleverness and haste, getting all the gold possible and picking up the Gem, a precious treasure, hidden on every level. The gold coins are always available and farmable, but Gems can be acquired just once per every level. With gold the player can buy consumable items, which makes surviving easier, and Gems provide permanent upgrades on Mook in the form of clothing and their upgrades. As for the dungeon, besides towers there are the traps (which are kind of mechanical monsters, contraptions with the goal to hurt us). The towers are the static threat, easily avoided, and the traps provide the thrill of being chased, but with a little wit they can be outrunned, or outsmarted. We created a very versatile set of abilities for the towers and the traps, as those were needed to be tailored for each level to provide balanced but always changing level of challenge. For example here is a tower that shoots fire projectiles. From the type of shot, through the velocity, and reload time, there are several settings and all were tailored to make a one-of-a-kind tower for that specific area of the map. This one effectively blocks a corridor, with the Gem at the end of it. Here you can see a delicate setup of a tower shooting Stabber traps in a specific timed pattern to provide a challenge to get the Gem. 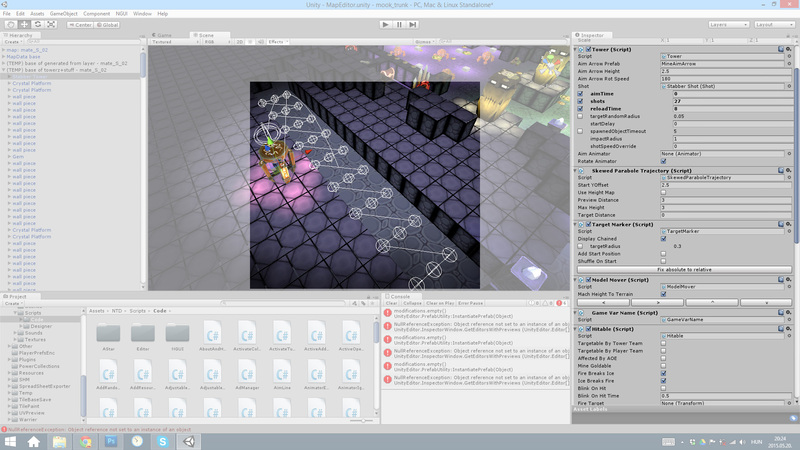 Here is an example of a patrol pattern for a group of Slicer traps, basically guarding the gold on the middle, combined with an Ice tower (in the game ice just slows us down) to make it a harder loot for the players. 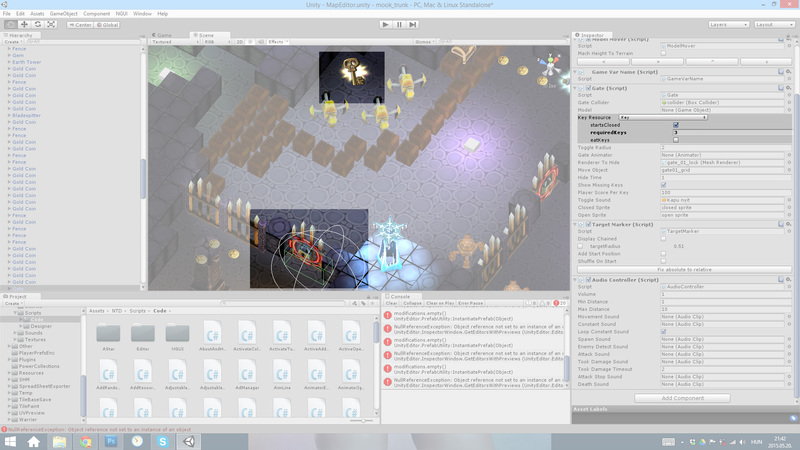 With these options we were able to create any kind of dungeon and by gradually mixing towers and traps we could provide a non-repetitive, evergrowing challenge throughout the whole game. Also, we had to keep in mind that the players want to feel rewarded, so the best loot areas are usually designed around some threat, but at the end of each level there is always a large amount of gold. 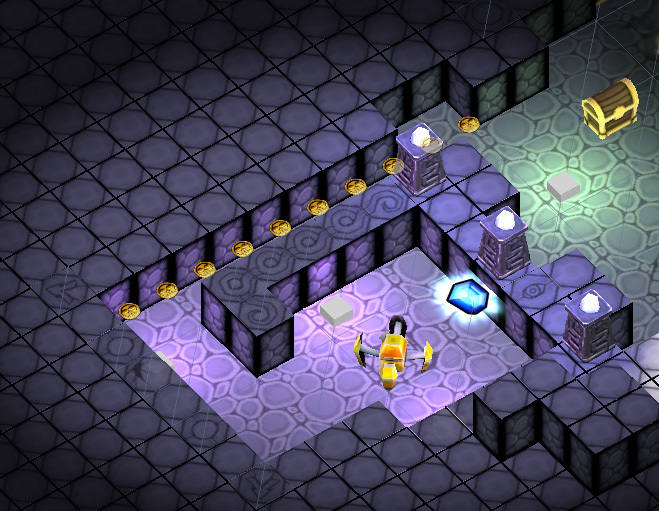 Loot is also used for the drive to explore the dungeon, or to guide the player to some not-so-obvious place. Gold coins showing the way to the Gem at an early level. But to make the players really go trough a level the way we want, our best tool was the Gate. This was simple, a gate either just opens on approach, or needs a key to be unlocked. And the amount of keys collected specifies that the gate opens or not. 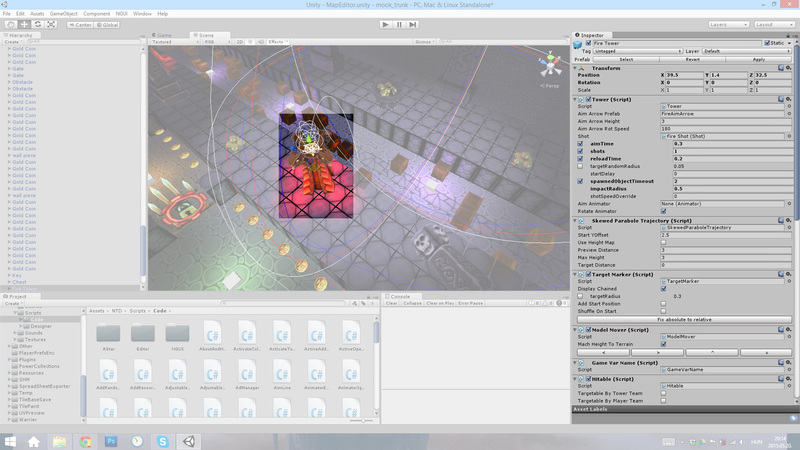 So, we could make levels with 6 keys needed to open the last gate, forcing the player to explore the dungeon. Also, there are levels where the Gem is guarded by a single gate, but getting the amount of keys requires thorough searching of the level. A heavily guarded 4th key, behind a gate which requires 3 keys. Of course all of this was not done in an instant, and was not obvious at the beginning, but this is what we ended up with. Goblin Quest: Escape! is Finally Here!